In shock after her husband was killed by a drunk driver while living in Thailand, Janelle Shantz Hertzler began searching for a way through the pain. Her struggle to make sense of her loss and find peace resulted in this moving collection. Told through heart-felt poetry and inspiring photography, Seasons of Solace expresses the spiritual journey of a grieving woman moving toward acceptance. Though written from one person's perspective, Hertzler's poems and photographs reflect the universal experience of loosing a loved one. Within the narrative lie broader truths of life and death, love and sorrow, allowing each reader to find his or her own story in its pages. Paula D'Arcy, author of When People Grieve says this about Janelle's book, "Janelle Hertzler's spare words take you to deep worlds. Brushing aside all unnecessary syllables, she unveils grief as the blow that it is, and the gift it can be. Through her images, she invites the reader to stand with her before the unchangeable, and learn not to turn away. A beautiful telling." 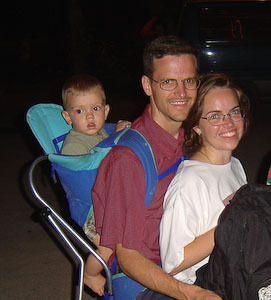 Janelle has also created a website for people who are working through grief. On the Seasons of Solace. section of the site, you will find more information about the book. 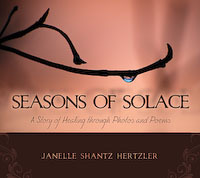 Janelle also offers moving Seasons of Solace poetry readings to churches, book clubs and support groups.